It's pretty much exactly what you'd expect. The "cream" part of Strawberry Cream is more noticeable in the scent than in the taste, though I can taste it. The tea doesn't actually taste completely like off-the-vine whole strawberries, but it's to strawberries what Celestial Seasoning's Raspberry Zinger is to raspberries. 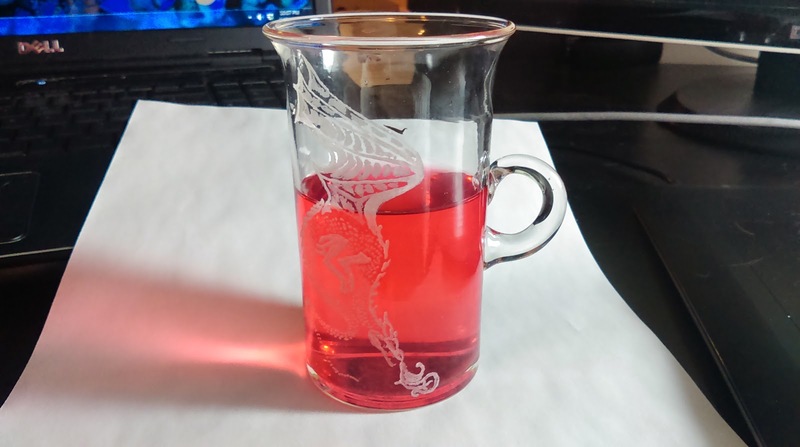 It's strawberry-flavored hot water, tart in flavor, brews strong, and is overall quite good. If you like strawberries, you'll like this one. It's resilient in brewing--I definitely used water that was too hot and steeped it a bit too long, with no sad results (though white teas do tend to get bitter when steeped much too hot or much too long, so don't go overboard). I've also brewed it at the correct time and temp and it's good there, too. Haven't brewed it in small enough quantities to try a rebrew yet. It's good both hot and room temp (probably iced, too, if you're into that). I can taste a hint of cream in the tea, but mostly it's tart. I haven't tried it yet, but add a little sugar and it'd probably be almost candy-like. It's a white tea, so good antioxidants. I'd recommend it for anyone who likes fruit-flavored teas. Experienced tea drinkers will appreciate that it does have a white tea as a base (it's a subtle flavor and hard to pick up on if you don't know what to look for), but mostly the white tea flavor is overpowered by the fruitiness. Strong fruit flavors tend to be a great intro to tea, and if you like strawberry, this is a good starting point. Then again, considering the price, new-to-tea drinkers might want to just grab a Raspberry Zinger/Lemon Zinger herbal tea. You'd save a ton of money and those teas are good, especially since it takes a while and a lot of tea-trying to be able to really appreciate the differences between a loose-leaf tea and a bagged tea. Otherwise, if you want to start with premium teas, or you want the antioxidants of white tea but aren't in love with tea in general, this is a great tea. Long story short: Tastes like strawberries. Very good, but you can get similar flavors from Celestial Seasonings at a lower price, so unless you want the antioxidants or just love loose-leaf, you might not find it worth it. it look, due to lighting).